There’s a few blind spots in the gaming history, certain genres that I never really tried and kind of missed the boat on. Some I’ve gone back to, like my recent play through the Metroid series and Castlevania’s Symphony of the night, or my attempts to get into Roguelike’s with Binding of Issac. Thankfully some genres are held deep in indie developers hearts so it’s only a matter of time before I get to try out certain much loves styles of games that to modern revivals. Wargroove has shown me what I was missing by not playing games like Advance Wars and Fire Emblem. Turn Based Tactics games were always something I looked at from afar, no idea really how they played and instead were something that I just ignored thinking they weren’t for me. I felt the same way about Civilisation until about 6 months ago when a friend and I grew tired of our weekly Age of Empires II games and decided to try our hand at a more strategic affair. This has set me up perfectly for Wargroove and Turn Based Tactics games, the genre where it’s part strategy and part puzzle. All mixing up into one of the most stressful and yet satisfying styles of play I’ve had in a long while. 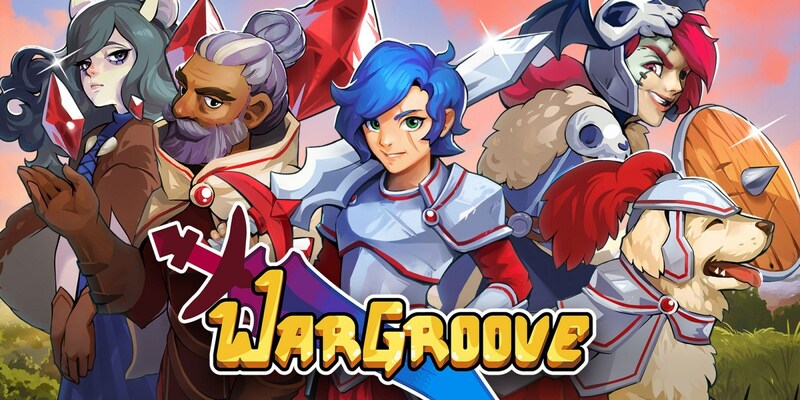 Wargroove, from Chucklefish, publisher of Stardew Valley and developer of Starbound, is from everything I can tell a screaming homage to the Advance Wars series first found on the Gameboy Advance, a series that hasn’t had a proper release (I’m ignoring virtual console re-releases) since the DS in 2008. 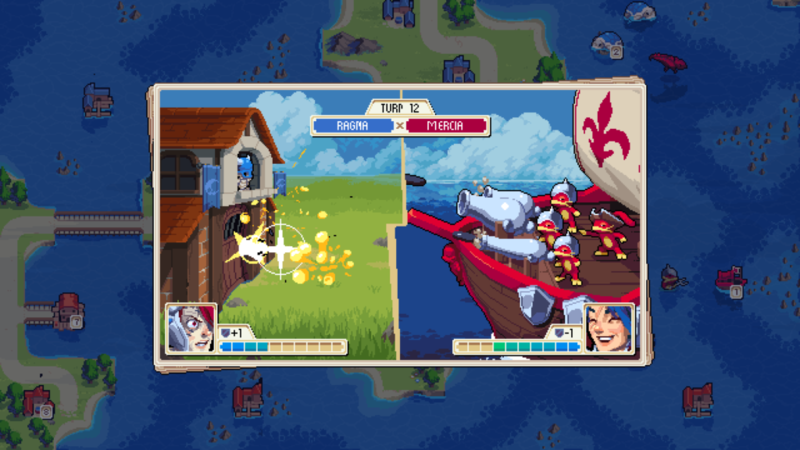 In Wargroove the concept is simple, you’re presented a top down map, you must either complete a set objective or alternatively take out your enemies stronghold or defeat their leader. Each member of your army has a set movement distance and attack range. You must balance all of these movement and attack numbers to get the upper hand. An added element is that each unit has almost a rock, paper, scissors style strength and weakness to other units. Pikemen are great against mounted units, mages can wipe out flying units with ease and so on and so on. Thankfully you don’t need to remember this information as you can click on any unit on the battlefield to find out whats the best unit to use and even see how far the opponents unit can move. All of this produces a great sense of satisfaction when a plan comes together, knowing that next turn a knight can make it to an enemy outpost, which produces a source of income each turn, an claim it for your own side all the while your ranged units and soldiers have enough movement to flank an enemy and wipe them out before they get the chance to counter the knight. Moments like this, where everything comes together is what Wargroove does best. What it doesn’t do so well with is in the story mode, there are far too many missions where you’ll feel like you’re just a couple of turns away from victory when from the opposite side of the map some high damage dealing enemy soldiers appear under the guise of ‘reinforcements’. I understand from a story perspective sometimes this makes sense and it does add something to the battles when done right, but far too often this seemed to happen 30 minutes into a really tough battle only for me to be wiped out a few turns later. You can’t strategise against random. Each unit has critical hit conditions that are listed in their bio. Positioning is the key for all of these crit conditions, being near your leader character or having another unit of the same type beside them all lead to higher damage. Damage is displayed before you confirm your attack by hovering the cursor over an enemy which shows the damage they’ll receive and the defence damage you get in return. If your unit should die it’s not the end of the world, units are almost encouraged to be burned through during a battle as for each outpost you’ve capture you’ll be awarded money each turn which can be used to buy new recruits for at any point during your turn. This does sometimes lead to an almost conveyor belt of death as you just keep chipping away at certain stronger enemies with a constant line of canon fodder spewing out from your base. The campaign mode is long, taking me somewhere in the region of 15 hours for me, though that was with me failing at a lot of VERY long battles. Where the game really hits strong however is its arcade mode, featuring random maps in quick succession that really just give the meat of the game, its puzzle like combat sessions. Also available is multiplayer, co-op and competitive all feature and there’s even options for asynchronous mutiplayer meaning you can play like you’re old people sending your next chess move through the post. Between the multiplayer and story mode you’d already be getting insanely good value for money by getting this, but add a map editor and a campaign creator, with cutscenes and everything, and you’d be a fool to miss out on this. 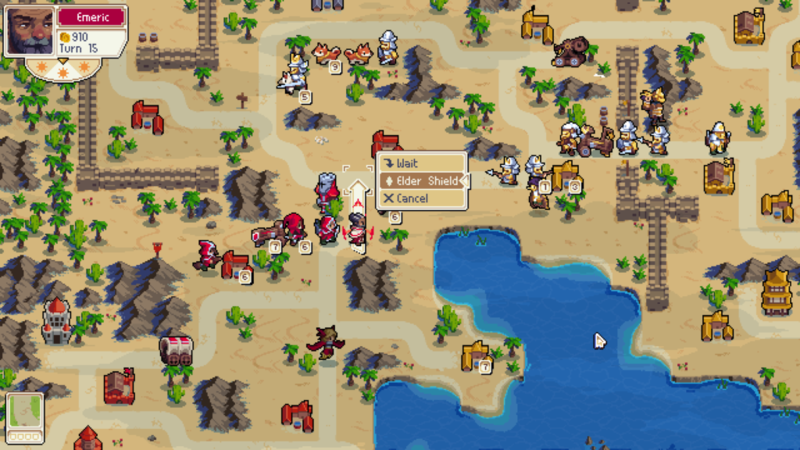 Given time I’m sure we’ll be seeing some wonderful custom content produced for Wargroove, I just hope that patches can improve the discover-ability of the best homebrew available. 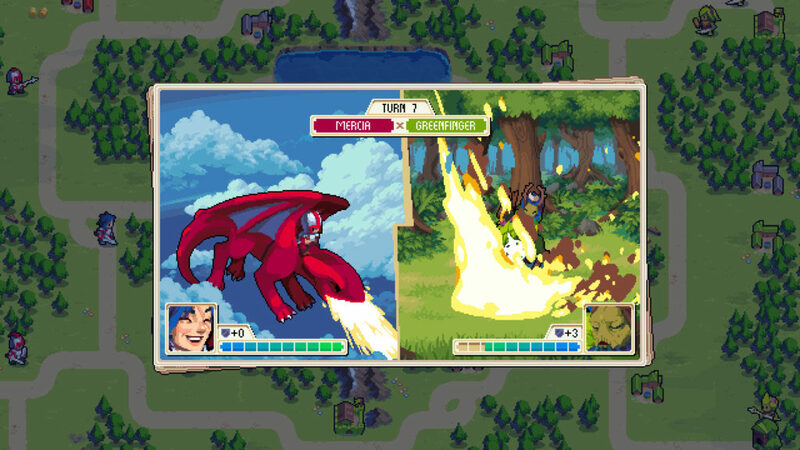 The games design is a huge selling point to the whole experience of Wargroove. Cute but justified pixel art gives all the units characters. Despite the sodliers all being cookie cutter repeats of each other you do still grow attached to them as a concept thanks to the frankly joyous cutscenes. When combat is initiated the top down view is replaced by a quick animation of the two combatants bumping into each other to see who gave and took damage and whilst you are able to speed these up with a button press I found myself never wanting to do so, the animation is just there for a bit of fun relief during what can be epically long battles. The soundtrack throughout is an epic fantasy affair suiting the nostalgic world perfectly. Wargroove is available on Xbox and PC but having put the time in on Switch I can safely say this is the platform to pick it up for. A great handheld experience that will kill any time you give it. With an amazing art style, genuinely funny scenes and dialogue in the story and some of the best representations of dogs that deserve a treat in games I can’t recommend this highly enough. Sure the missions can be incredibly frustrating and the inability to undo mistakes or quick save or load on the Switch feels downright cruel at times there is still a lot of fun to be had with this game. On a system that also has the joy that is Into the Breach it hopefully leads the way for more of the Turn Based Tactics games to find a very worthwhile home.